A team of UCF researchers has produced the most efficient quantum cascade laser ever designed - and done it in a way that makes the lasers easier to manufacture. Quantum cascade lasers, or QCLs, are tiny - smaller than a grain of rice - but they pack a punch. Compared to traditional lasers, QCLs offer higher power output and can be tuned to a wide range of infrared wavelengths. They can also be used at room temperature without the need for bulky cooling systems. But because they're difficult and costly to produce, QCLs aren't used much outside the Department of Defense. 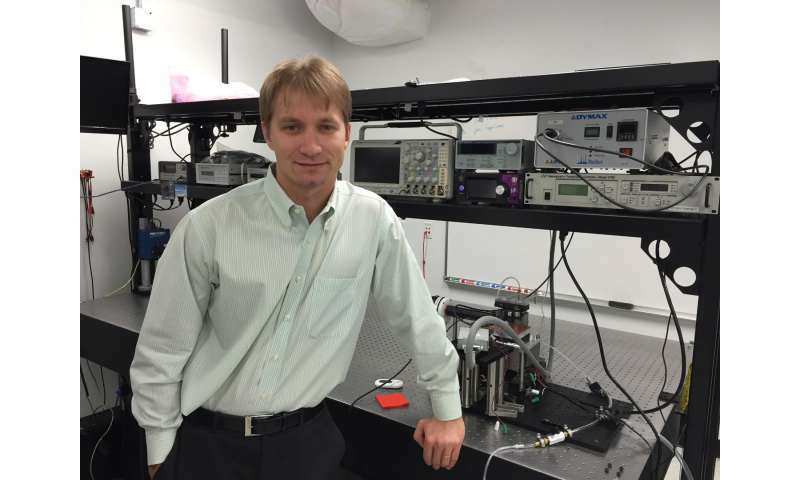 A University of Central Florida team led by Assistant Professor Arkadiy Lyakh has developed a simpler process for creating such lasers, with comparable performance and better efficiency. The results were published recently in the scientific journal Applied Physics Letters. "The previous record was achieved using a design that's a little exotic, that's somewhat difficult to reproduce in real life," Lyakh said. "We improved on that record, but what's really important is that we did it in such a way that it's easier to transition this technology to production. From a practical standpoint, it's an important result." That could lead to greater usage in spectroscopy, such as using the infrared lasers as remote sensors to detect gases and toxins in the atmosphere. Lyakh, who has joint appointments with UCF's NanoScience Technology Center and the College of Optics and Photonics, envisions portable health devices. For instance, a small QCL-embedded device could be plugged into a smartphone and used to diagnose health problems by simply analyzing one's exhaled breath. "But for a handheld device, it has to be as efficient as possible so it doesn't drain your battery and it won't generate a lot of heat," Lyakh said. The method that previously produced the highest efficiency called for the QCL atop a substrate made up of more than 1,000 layers, each one barely thicker than a single atom. Each layer was composed of one of five different materials, making production challenging. The new method developed at UCF uses only two different materials - a simpler design from a production standpoint. Lyakh came to UCF in September 2015 from Pranalytic, Inc., a California-based tech company, where he led QCL development and production. His research team at UCF included graduate students Matthew Suttinger, Rowel Go, Pedro Figueiredo and Ankesh Todi, and research scientist Hong Hsu. Great stuff! I've been waiting forever already for such a marvelous non-invasive diagnosis tool! And I've been waiting for decades for a workable hand phaser!